Two months ago a small group of KDE enthusiasts, namely Adriaan, Roman, and me traveled to Berlin to attend Qt World Summit 2018. 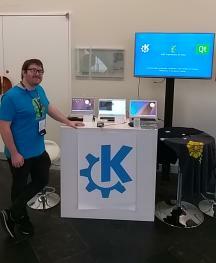 At our little booth we showcased Plasma running on a variety of devices, ranging from a Nexus 5X running Plasma Mobile through two ARM laptops to the powerful KDE Slimbook. Plasma was praised for its performance and reliability and since the focus of the event was mostly on embedded systems, we could easily demonstrate with our selection of devices that Plasma and the KDE Frameworks are a viable option for an endeavor in this area, too. It was very interesting to see the diverse set of people presenting their products and roaming the stalls, to see where Qt is in use today without you even realizing. 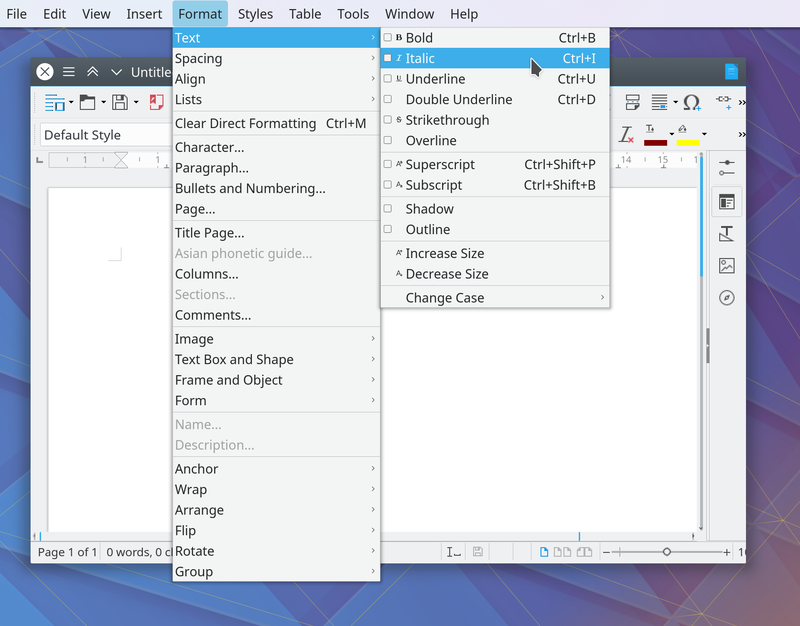 We were approached by several companies evaluating using KDE Frameworks in their products and also tried to lay a foundation for an eventual partnership. And then there was Daimler who just parked an A-Class in the hallway, whose MBUX infotainment system is also powered by Qt. Give Milian, author of hotspot (a profiler GUI we use a lot for Plasma), any device and he immediately starts profiling! 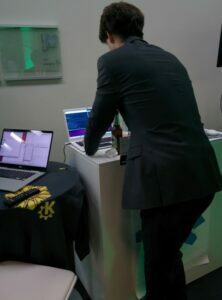 The star of our stand, however, was the MNT Reform DIY Laptop which is a retro-style ARM laptop running Plasma with a mechanical keyboard and even a real trackball! 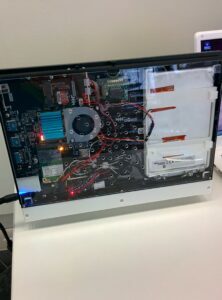 Its case was 3D-printed just the day before, including a rubber band to hold the screen shut, and for educational purposes sported a transparent bottom cover so you could look inside. What got us very excited was the fact that it ran mainline Debian and a super recent kernel version, something that’s quite uncommon when it comes to ARM devices. Even better: its i.MX 6 SoC let Plasma fly and we didn’t even do any adjustments for the device. It really shows that our hard performance work and focus on polishing the stack over the past years is paying off. 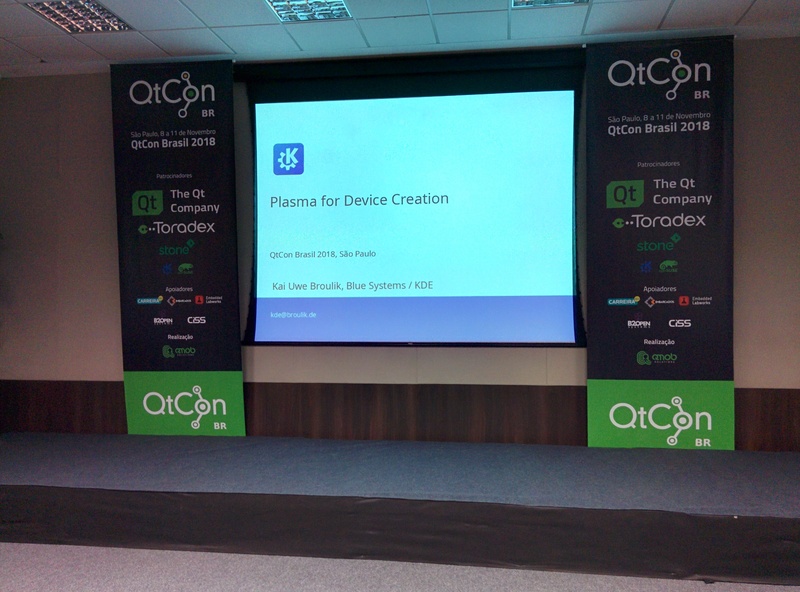 Earlier this month I had the chance to give a keynote speech at QtCon Brasil in São Paulo, Brazil. It was the second leg of a three weeks long trip across the Americas that began with a company meeting in the US. 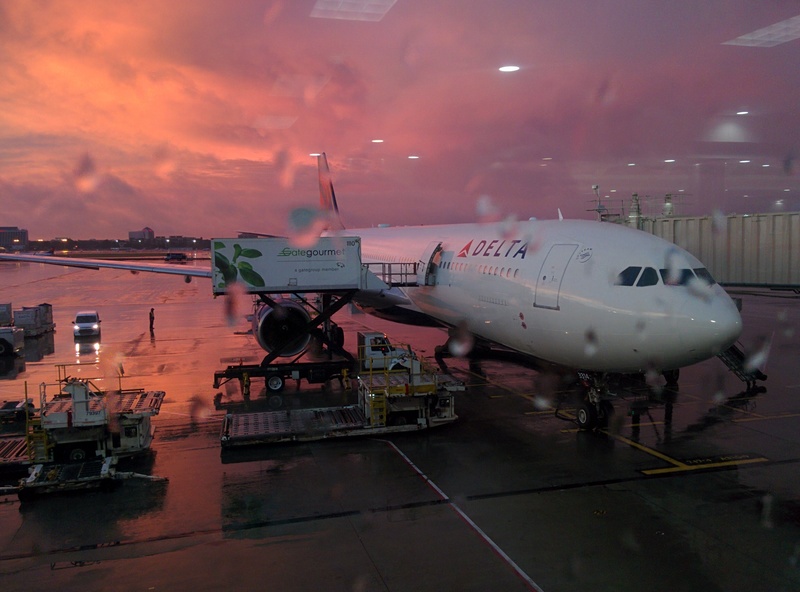 After a ten hour flight on the Airbus A330 pictured, I arrived at Guarulhos airport in the morning. I was lucky to have found myself on a half-empty plane with an entire row of seats for me alone. The conference lasted Thursday to Sunday with the first two days reserved for embedded programming and 3D development trainings. Not having signed up for any of these, I took the opportunity to explore the city on Friday. I visited the Museu de Arte de São Paulo (MASP) and walked over to the district of Liberdade which is home to the largest Japanese community outside Japan. Unfortunately, I couldn’t visit the Museum of the Japanese Immigration as they didn’t accept credit cards. Saturday and Sunday is when the main talks happened. With my rudimentary Latin and Spanish knowledge I tried to make the most of them, since they were all held in Portugese. Nonetheless, I quite enjoyed the talks about Qt for Python, a live demo of a setup using Boot to Qt, and Qt “for Robots”. My speech was Sunday morning, entitled “Plasma for Device Creation” where I explained to the audience what Plasma is, how flexible it is, and that it can be virtually anything you want it to be. An important part of the presentation was to present ways to get in touch with the KDE Community and who to approach when you want to realize this amazing product vision you might have. While there was no recording of my talk, you can download the slides as a PDF. 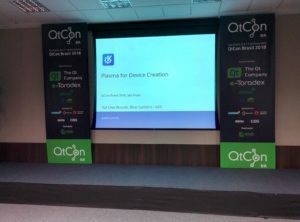 Many thanks to the organizers of QtCon Brasil for hosting the event, spreading the word about Qt down there, and inviting me over to my first trip to the South American continent! After my arrival at the airport on Friday I attended the welcoming event on the top floor at the university, with beautiful city scenery in the background. It was a great opportunity to meet new faces, of which there were many at this year’s Akademy; some of them have been valuable members of the community for years with nobody having them actually seen in person, up until now. Continue reading I was at Akademy 2018! Posted on 2018-08-24 2018-08-24 Categories Planet KDELeave a comment on I was at Akademy 2018! Please ping me, if you’re around and planning to come (contact info can be found in the Impressum, or tell kbroulik in #plasma on Freenode), so I can extend the reservation, if needed. 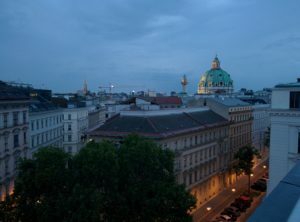 In two weeks I’ll be in Augsburg at the 16th Augsburger Linux-Infotag. 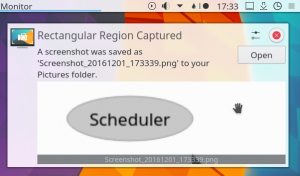 Here you’ll have a chance to meet in person, have a look at the latest and greatest Plasma Desktop and see what’s coming up for Plasma 5.10 and other future goodies! Continue reading What’s up for 5.10? Posted on 2017-03-07 2017-03-07 Categories Planet KDE70 Comments on What’s up for 5.10? In keeping with tradition of LTS aftermaths, the upcoming Plasma 5.9 release – the next feature release after our first Long Term Support Edition – will be packed with lots of goodies to help you get even more productive with Plasma! 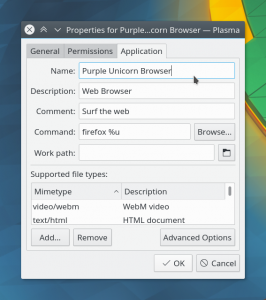 Plasma’s mantra is to help you get stuff done faster, to not stand in your way. In past releases we added many small tools for you to achieve your tasks more quickly and spend less time fiddling with the desktop environment.